Preschool number activities are even more fun when cutting and pasting are involved. Children are then able to practice several skills with one worksheet. 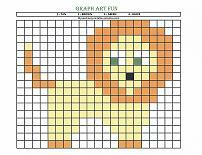 Use safety scissors and pasting to help develop fine motor skills. Choosing objects and placing the correct number on the sheet reinforces counting. The fishbowl worksheet also includes a place to practice writing the number. ... paste the correct number of fish in the fishbowl. 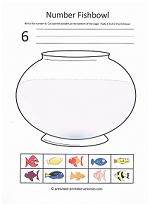 This worksheet includes a space to practice writing the number. 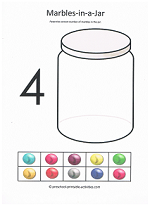 Use simple counting cards and have the kids’ place the correct number of objects on the card. Use small blocks, goldfish crackers, marshmallows or anything else you have on hand. Use a bowl or a toy dump truck and see how many blocks you can fit inside. Choose a number and have your child hand you the same number of toy cars, puzzle pieces, etc. Identify numbers on a toy telephone, calculator, street signs,license plates, etc. Write numbers on paper cups or Popsicle sticks and have the kids line them up in order. Read counting books. 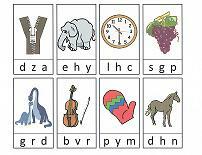 Your local library should have tons to choose from. Number Worksheets - Lots more ways to have fun with counting. Dot-to-Dot Printables - Connect the numbers and color fun pictures. 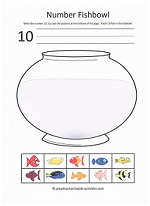 Counting Cards - Printable Cards for the numbers 1-10. Preschool Addition Worksheets - Lots of ways to practice addition. Preschool Subtraction Worksheets - Cross out objects to find the answer. 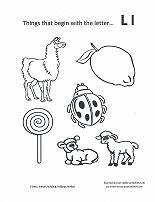 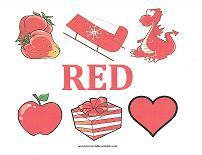 Number Coloring Pages - Color the correct number of objects. 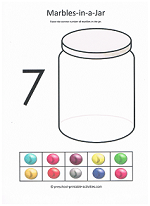 Number Wall Cards - Fun Bug Theme wall cards to reinforce counting skills.